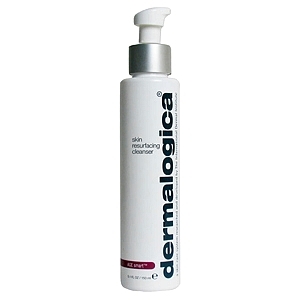 This smoothing cleanser provides an exceptional beginning to your anti-aging regimen. It delicately removes dirt, debris, excess oil and makeup, leaving the skin fresh and pure. Lactic acid exfoliates away dead skin cells while hydrating and brightening the skin. Rose flower oil calms sensitivity, and vitamin E provides antioxidant protection, conditioning, and softening benefits all while locking in moisture for a plumper, more supple complexion. Developed for mature and prematurely aging skin, this gentle cleanser prepares the skin for further treatment, leaving it perfectly cleansed, soft and comfortable. Lightly lather in hands and apply to damp face and throat morning and evening, massaging with light, upward strokes for at least 30 seconds, avoiding the eye area. Reduce to one use per day if any sensitivity develops. Follow with Dynamic Skin Recovery SPF30 when used in the morning. Ingredients: Water (Aqua), Sodium Laureth Sulfate, Lactic Acid, PPG-2 Hydroxyethyl Cocamide, Cocamidopropyl Betaine, Glyceryl Stearate SE, Polyacrylate-1 Crosspolymer, Tocopheryl Acetate, Titanium Dioxide, Sodium Hydroxide, Disodium EDTA, Benzyl PCA, Phenoxyethanol, Butylene Glycol, Citral, Citronellol, Eugenol, Farnesol, Geraniol, Hydroxycitronellal, Isoeugenol, Limonene, Linalool, Acorus Calamus, Aniba Rosaeodora (Rosewood) Wood Oil, Eugenia Caryophyllus (Clove) Flower Oil, Helianthus Annuus (Sunflower) Seed Oil, Pelargonium Graveolens Flower Oil, Rose Flower Oil, Citrus Medica Limonum (Lemon) Peel Oil/Extract, Caprylic/Capric Triglyceride.